This brew is my first from California's Firestone Walker Brewing Company. I'm thinking starting with a double / imperial IPA is a great introduction. It pours a somewhat pale and crystal-clear orange - think orange Jell-O or pale apricot. The head is tall, just off-white, and slightly creamy. It leaves rings and spots of lacing as it lowers. The aroma is bright and crisp: tangerine, flowers, grapefruit, a bit of honey and malt. Great. I'd say bottle it up, but that's already been done. The flavour, initially, comes across as a little hot / alcoholic, unfortunately - but, thankfully, that gets increasingly less with each sip... this beer gets better and better as it warms up and goes on. As the malt notes increase with warmth, they mask the heat. I was thinking this would miss the mark a bit, but it's hitting the right spot right about now, one third of the way through. It's bitter, citrus-y (mostly grapefruit), piney, a little sweet & rounded from the malt... this is a nice beer that becomes more balanced as it goes. That being said, the alcohol seems to come out a bit in the last third again. In terms of how it feels in the mouth, there is a bit of burn / heat from the alcohol (9.5%), but that's pretty minimal overall. It's a little resinous and sticky, and also a little light considering how "big" this beer is. The finish is a little sweet, but mostly tingling bitterness. Unlike my wife, who, after one sip, said, "It was like I took a bite of the rind of a grapefruit soaked in alcohol," I quite enjoyed this one. 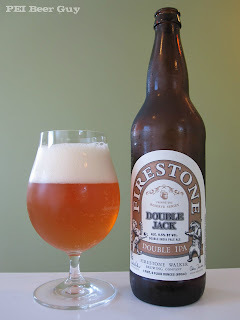 Being a bitter, strong, double IPA, it's not everyone's (read: IPA-inexperienced people) cup of tea... er, glass of beer. But, for the converted, this is a nice, big beer. As a parting thought, I'd be curious as to how this would taste and feel if it was less filtered. PS - the burps taste so good. If you're an IPA fan / hop-head, you'll understand.